Mount Field is located on the Willey Range Trail in Crawford Notch. Although there is a nice little downlook just below the summit, the summit itself is a wooded and viewless. 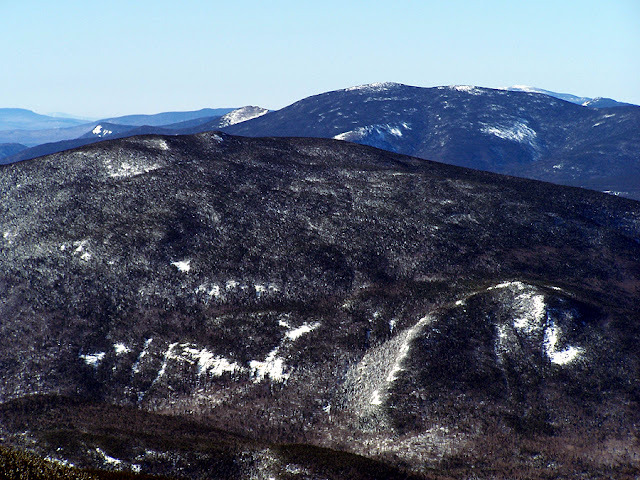 Mount Field is often climbed by way of the Avalon Trail, or, along with Mount Tom and Willey via the Willey Range Trail. Mount Field along with Mount Avalon is a great little hike for beginners with cool views from the tiny open summit of Mount Avalon. -Avalon Trail: 2.8 miles, 2,400 elevation gain. The Avalon trail has easy to moderate grades with good footing most of the way except for a super steep rocky section below the summit of Mount Avalon, the footing through here is eroded. The Avalon Trail ends at the Willey Range Trail about 100 yards north of Mount Field's summit, Turn left to reach the summit which is a pile of rocks. Avalon, A-Z, Willey Range Trail: 3.3 miles, 2,150 feet. Avalon and A-Z Trails have easy to moderate grades with generally good footing. The Willey Range Trail has good footing with a very easy grade up to Mount Field's summit. Kendron Flume, Ethan Pond, Willey Range Trail: 4.1 miles, 3,100 elevation gain. The Kendron Flume Trail (1.3 miles) has good footing and easy to moderate grades up to the Kendron Flume The trail then gets steeper with rough and rugged footing until reaching the Ethan Pond Trail junction. The Ethan Pond Trail (.3 miles) has excellent footing on relatively easy grade until the Willey Range Trail junction. The Willey Range Trail (2.5 miles) has rough footing and and becomes increasingly steep on the approach to Mount Willey's summit. There are several ladder steps up the steepest sections for safe passage that helps prevent eroding. There is an outlook just below the summit where Gray Jay often beg hikers for hand outs. From Willey to Field the trail has much better footing with easy grades as it descends and runs along the ridge with limited views into the Pemigewasset Wilderness as it heads up Mount Field's summit cone.